NIELIT Gorakhpur Faculty Recruitment 2019 Walk In Interview Jobs For NIELIT HQ * Centers | Teach Computer Students with Government Certification | NIELIT Gorakhpur O Level Faculty Jobs For Freshers. A Level Faculty Vacancy in NIELIT Gorakhpur, NILIT. NIELIT Gorakhpur Faculty Recruitment 2019 NIELIT Gorakhpur Application are invited from NIELIT Gorakhpur HQ and Its Centers List to fill Faculty of A Level, CCC Teaching, O Level and other Software courses that runs by Nielit (National Institute of Electronics and Information Technology.). 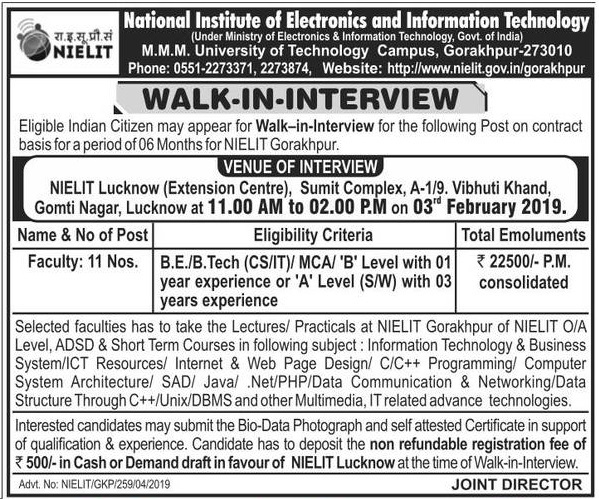 Eligibility Candidates may walk in Interview for the following posts on contract basis for a period of 6 months in nielit gorakhpur centers list 2019. O Level A Level Faculty Walk in Interview: In NIELIT Lucknow Venue of Interview headed by staff members. You may check from 1st Week of February 2019. Place of Direct Interview Jobs in Computer Center: NIELIT Lucknow (Extension Center), Sumit Complex, A-1/9. Vibhuti Khand, Gomati Nagar Lucknow at 11.00 AM to 2.00 PM on 3 February 2019. Information Technology & Business, Internet, Web Design, Computer System Architecture/SAD/JAVA/,NET/PHP/DATA Communication etc. How to apply: Interested candidates may submit the biodata photographs and self attested certificates in support of qualification & experience. Candidates have to deposit the no refundable registration fees of application fees 500 in cash or demand draft in favor of Lucknow, Department of NIELIT Faculty Recruitment 2018-19. NIELIT Gorakhpur Faculty Result 2019: NIELIT Gorakhpur Faculty Result and Appointment letter may be given on spot. 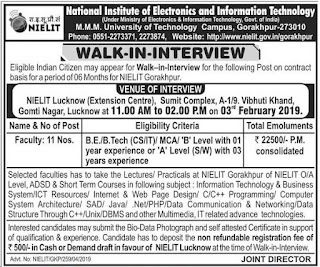 NIELIT Gorakhpur Walk In Interview on 03rd February 2019 from 11:00 AM to 02:00 PM for the post of Faculty on Contract basis for a period of six Months for NIELIT Gorakhpur at NIELIT LUCKNOW - Click here to view.